General Information: Enjoying these ivory-hued spears prized for their subtle, earthy flavor is a rite of spring in the valleys of southern Germany. The technique of molding earth around asparagus spears as they push up out of the ground, thus keeping them sheltered from chlorophyll-producing sunlight (which would turn them green), was apparently developed in France in the mid-1600s, and the practice soon spread to Germany and other parts of Europe. 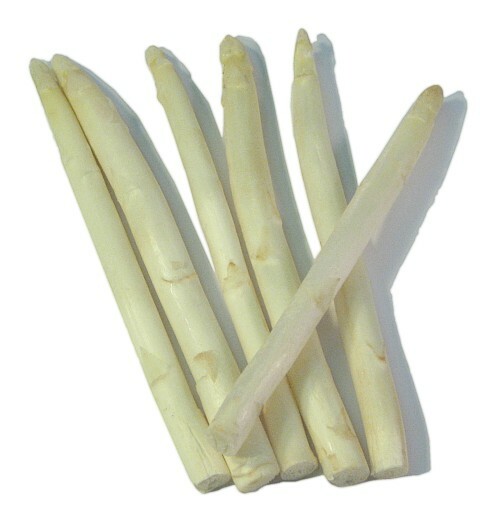 Growing white asparagus requires patience and a measure of backbreaking labor. Today the vegetable flourishes in Asia, North Africa, and South America as well as Europe - almost anywhere with loose, sandy, mineral-rich soil and a warm growing season.